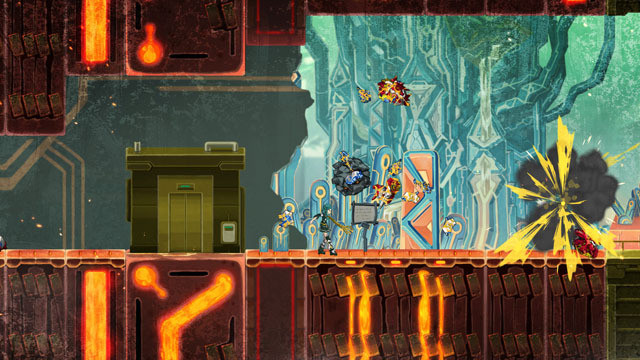 Game Freak is the developer behind a certain monster capturing battling game (Pokémon), as well as a handful of sidescrolling action games, including Pulseman and Drill Dozer, and now they're back with an experimental game entitled Giga Wrecker. In this physics-based action puzzler, you play as a cyborg girl who is able to combine scraps of metal to create new objects, including weapons. Your world has been invaded by robots, and you must use your abilities to smash through obstacles, build platforms to reach new areas, create objects of different shapes to solve environmental puzzles, and tear robotic baddies to bits. Giga Wrecker has just left Early Access and is now available for PC via Steam.